I really like this watch a lot, it looks great and so far it keeps perfect time.I certainly would recommend this watch to friend and family. 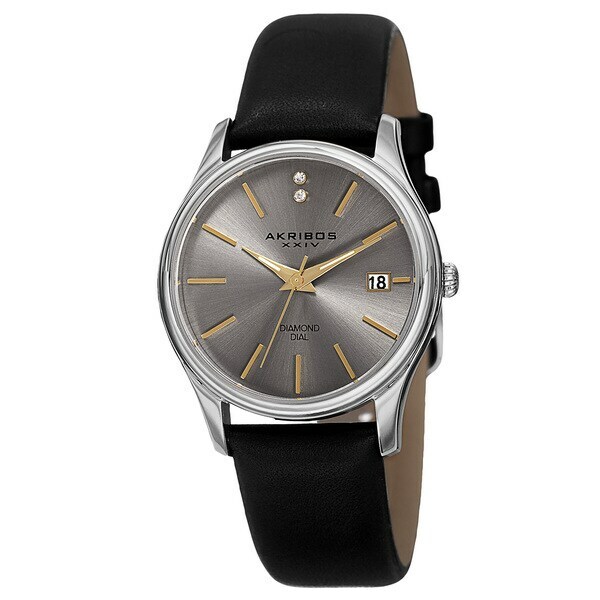 This Akribos XXIV women's watch features a date aperture at the three o'clock position and a knurled edge crown for easy control. The stick markers and genuine diamonds on the radiant sunray dial create a chic look that will add a touch of style to your attire. A little disapointed with the look of the watch. I called customer service, who were very helpful, I was concerned about the "diamonds" on the face of the watch. Even under very bright lights I couldn't see them. I thought it was a mistake and was sent a replacement right away. Unfortunately, the second watch was the same. I think it would be better if Swarovski crystals were used in place of the "diamonds", the watch might look like the picture. The watch is a good timekeeper, I like the leather strap. I bought it to wear with business suits and thought the diamonds would give a more feminine look. I absolutely love this watch. For everyday wear it is perfect for work weather I dress casual or semi casual. The band is a nice touch of leather and solid black with a silver copper type face and two microscopic diamonds at the top. It appears well built and I'm so pleased with this purchase. I plan on ordering three more styles from this particular brand. Love it love it love it. Did I mention I got it on sale too. That made it all the more sweeter. I'm always talking to my co workers about the nice items I purchase from Overstock. I work in a prison so affordable quality items is always a plus for us. Very nice watch! The band is genuine leather, sturdy and wide. I bought this watch to wear as an every day casual type of watch! I Love it! This watch looks more expensive than the cost because the face is so unique with the silver face, grey background and gold hands. Leather strap is thick and trendy wide. Recommend this watch. Packaged with care and presented as an expensive gift. I received my watch in such elegant packaging which shows the care put into this time piece. The Akribox XXIV Women's Quartz Diamond watch is just beautiful!! So classy! The price was fantastic! You could not get a better price anywhere else! This is an awesome buy!! At first glance, this watch looks very casually elegant with the faux alligator pattern real leather, black band. Upon closer look, the silver diamond studded bezel is eye catching and the face of this watch is stunning. It is very light blue mother of Pearl studded with a pattern of silver. The watch face has Roman Numerals on the Baby Blue Mother of Pearl. There is a second hand. The little devices to set the time, etc have small dark blue stones on the tips. There are so many details. I wear this watch with jeans, joggers and dress up; it blends with everything. So far it has been very durable snd I do not take it off around humidity or water except bathing. Other more expensive watches I have owned could not stand up to any moisture-but this watch has no signs of moisture under the glass. So far, I am loving this beautiful watch. Beautiful watch! Expensive-looking quality, it looks even more impressive than the picture. The face is elegant and the leather strap is very good quality. I love the look. Looks very rich. The strap is nice and soft. The face is the perfect size. Nice looking watch. As other reviewers have mentioned, the diamonds are minuscule. The date "window" is also tiny, so much so, that it is very difficult to read and effectively worthless. If you are looking for a decent timepiece at a reasonable then you will be satisfied. Don't buy it for the add ons. This is a beautiful watch. I have two problems with it. The first is that the band is appaarently intended for large women. Even though I am 5'8" and 180 lbs., the band, on the tightest notch, is too big for me. The other issue, which is really not important to me, is that the date window is a total joke. I can't even read it with my glasses and a magnifying glass together. All said, I'm basically really happy with it an will keep it. Very nice watch ! It looks classy . The band is made of black leather but not stiff like other bands. Just like the picture shows. I have received many compliments on the watch! Love it. It’s comfortable and functional. Comfort band, easy to read and over all a great purchase. I purchased this item as a Christmas gift. I was very pleased with the quality of the item and it had a an extra gift included. I would highly recommend this product. Recieved this watch and I loved the watch, but it was too big for my wrist. I tried to make it work, but just too big for me, Great watch for someone with a bigger wrist and it's a great price, too. I had to send back with my uch regret! I love this watch for everyday wear. The diamonds are very very small. But thats what I like about. "When is this watch available in colors other than red and green?" "Is my watch Green? I want silver no green please"